Well, isn’t this cool? 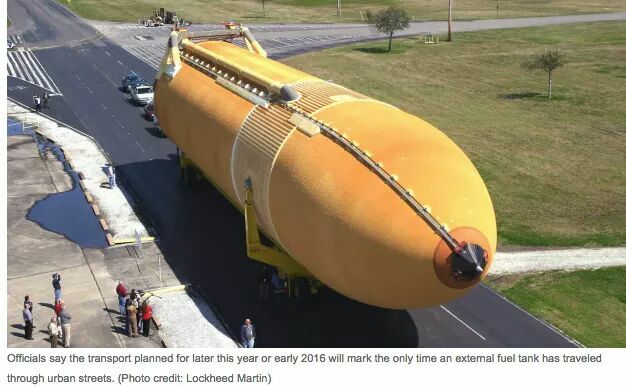 And, since I missed watching Endeavour navigate the streets of LA in Oct., 2012, I will have to prioritize seeing the external fuel tank’s trek sometime early next year. I have always wanted to see one of these tanks up close. I saw Endeavour at the California Science Museum last summer. What a treat that was! Now, I will get to see the fuel tank. With the exception of seeing a landing, my space shuttle viewing list will be complete. (I saw Endeavour’s last launch in May, 2011, and the flyovers and landing at LAX in Sept., 2012. Please see my YouTube videos for more information). If you would like a charismatic speaker on the space shuttle history and program, or any space, astronomy, or STEM Education topic for your next event, call 858 848 0860 or email asksandy [at] sandyeulitt [dot] com today.